The Islamic, church and communist forces are always working towards creating disunity in the Hindu society. Now some political parties and other organisations too have joined the bandwagon. Their modus operandi shows that they want to spread unrest in the Country. If in Bhima Koregaon in Maharashtra, they are trying to divide the Marathas snd Dalits, in Pathalgadi in Jharkhand, the church and maoists are trying to divide the tribals from the Hindu society. On the other hand, in Saharanpur, we witnessed a violence to upset the SC and forward caste harmony whereas in Una, it was meant to drive a wedge between the SC and rest of the society. In the recent past, we have come across a phenomenon called urban naxals, which can stoop to any level, from maligning Indian culture, to encouraging naxalites, to even conspiring to kill the Prime Minister. The investigative agencies too have reported such incidents, state governments of Kerala and West Bengal, too, have done everything in their capacity to disintegrate the hindu society, even giving a go by to constitutional norms. A conspiracy is being hatched to unite the dalits with muslims, whereas Baba Bhim Rao Ambedkar himself is on record having called the muslims, barbaric and untrustworthy. 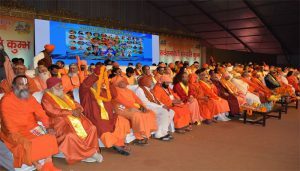 The Hindu society has been united by sages like Valmiki, Ravidas, Guru Nanak, Ramanujacharya, Ramanandacharya, Narayan Guru, Swami Vivekanand, Swami Dayanand and great persons like Veer Sawarkar, Mahatma Gandhi, Dr. Hedgewar from time to time. In the Kumbh mela in Prayagraj, everyone comes together leaving aside their caste, creed and feelings of upper and lower caste. Dharma Sansad calls upon all to reject pseudo secularism, casteism, regionalism, linguistic chauvinism and defeat the political parties that promote such anti national and anti hindu feelings.